Though Christmas was very different in the Middle Ages, many of the pastimes and activities that we associate with it would have been familiar to medieval people. Feasting, playing games, singing, drinking around a fire, decorating the house with evergreens, and giving gifts, are just some of the traditions enjoyed in the medieval festive season. As this passage illustrates, Christmas in the Middle Ages was a lengthy affair. Preparations and celebrations started well before 25 December, and continued long after. 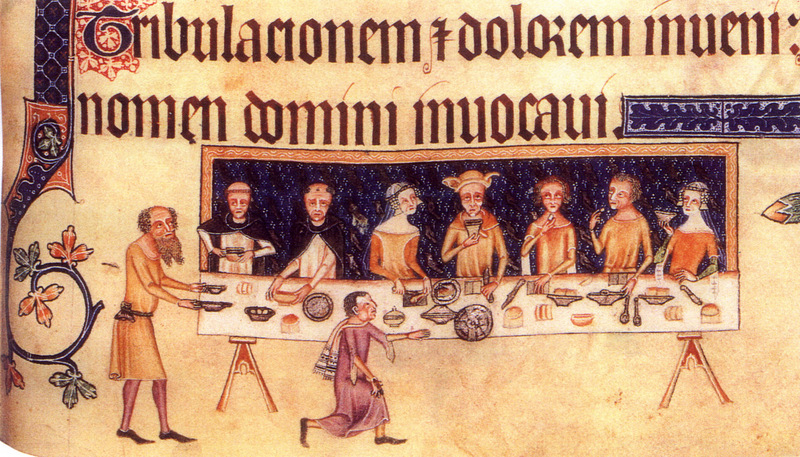 Though peasants returned to work after Epiphany (the twelfth day of Christmas or 6 January), the higher ranks might celebrate for longer, like Arthur’s hosting of tournaments and feasting over fifteen days. Truly extravagant festivities might even extend until Candlemas on 2 February. Chewettes on Flesch Day. Take the lyre of pork and kerue hit [carve it] al to pecys and hennes therwith and do hit in a panne and frye hit and make a coffyn [pastry] as to a pye smale and do therin and do theruppon yolkes of ayron [eggs] hard, pouder of gyngur and salt, couere hit and fry hit in grece [grease] other bake hit del and serue forth. It’s easy to imagine Richard II’s court celebrating Christmas over many days like King Arthur, eating course after course of the dishes described in the Forme of Cury. An account book of 1377 records that twenty-eight oxen and three hundred sheep were eaten at the king’s Christmas feast, and the chronicler John Hardyng, describing the excess of the king’s household in the 1390s, notes that ten thousand people a day attended Richard II’s court and that they were provided with food and drinks by three hundred cooks and servants. Quieter pursuits, such as board games and cards were clearly suitable for a house in mourning, but louder and more spritely Christmas entertainments, such as singing, playing music and watching masques were not. This entry was posted in The Parchment Mirror and tagged Arthur's court, Christmas, Christmas games, Christmas Middle Ages, entertainment, Forme of Cury, Gawain poet, Guinevere, Guy Ritchie, historical consultant, John Hardyng, John Paston, King Arthur, King Arthur Films, King Arthur Movie, King Arthur Movies, Knights of the Round Table, Lancelot, Margaret Paston, medieval, Medieval Christmas, medieval court, Medieval feast, Mince pies, Richard II, Sir Gawain and the Green Knight, Thomas Malory on December 22, 2012 by Sarah Peverley. For most of us, tomorrow – 21 December 2012 – will pass like any other Friday before Christmas; finishing work for the holidays, having a few drinks with friends, doing last minute shopping, or wrapping presents, will be the most eventful things we do. Yet some of Earth’s citizens will wait with bated breath to see if predictions associated with the 2012 Phenomenon come true. Over the last few decades, the idea that the world will end or transform on this day has been advanced by numerous films, documentaries, books, news reports, advertising companies, and internet media. Whatever our individual response to the ‘end of days’ hype, the prophecies about 21 December reflect mankind’s long-standing fascination with Last Things, Apocalypse and Doomsday. In the Middle Ages, it was commonly believed that 15 signs would herald Christ’s Second Coming and warn of the impending ‘domesday’*, when all men would be judged and sent to heaven or hell. The signs generally include (with some variation): 1) The sea rising; 2) The sea receding; 3) The sea returning to normal; 4) Sea monsters rising up and making hideous noise; 5) All water burning; 6) Trees and plants sweating blood; 7) Earthquakes toppling buildings; 8) Rocks and stones clashing together; 9) Hills and mountains turning to powder; 10) Men leaving their hiding places in fear and silence; 11) The bones of dead men rising; 12) Stars falling to earth from heaven; 13) Death coming for the living; 14) Heaven and Earth burning; 15) Heaven and Earth being made new and the dead rising to be judged. Linked with St John’s Revelations, and spuriously attributed to Saint Jerome, these portents appear in texts, such as the Pricke of Conscience, Cursor Mundi, and Legenda Aurea, in the Chester cycle of mystery plays, in sermons like John Mirk’s Festial, and as images in illuminated Books of Hours and Apocalypses. It is possible that many of England’s churches were once adorned with representations of the portents in paintings, carvings and stained glass, but only two examples survive today: a window in All Saints’ Church, North Street, York, and an alabaster altarpiece now in the British Museum. The terrified donors of the window watch the end of days at the bottom of the window. The signs were designed to encourage sinners to reflect upon the state of their soul and be mindful that the last days would be ‘cruell’, ‘ferdfull and horrybull’ (Mirk, Advent Sunday Sermon). They frequently accompany descriptions or images of Judgement Day itself, which in Christian iconography is easily recognisable. Christ is often seated on a rainbow (a nod to the rainbow sent to Noah after the deluge), displaying his freshly bleeding wounds, and accompanied by saints and angels, who hold the tools of the crucifixion (the cross, nails, crown of thorns, spear etc.) and trumpet to announce the Judgement. The dead are shown rising from their graves, and heaven and hell appear, with attendant angels and demons. The basis of all judgement scenes is the description of Doomsday found in Matthew 25: 31-46. This account describes what is popularly known as the separation of the sheep and the goats, representative of good and bad souls; the (good) sheep are placed on the right of Christ, or the left of the image being viewed, and the (bad) goats are placed on his left, the right of the image. So, if you notice the earth trembling, sea monsters making a lot of noise, or a red dew on your plants tomorrow, make sure that you’re standing on the right of the man on the rainbow and prepare for doomsday medieval-style. This entry was posted in The Parchment Mirror and tagged 2012 phenomenon, 21 December 2012, 21-12-12, All Saints, apocalypse, comets, doomsday, end of days, floods, judgement day, last things, medieval apocalypse, medieval art, medieval culture, medieval eschatology, medieval expert, medieval manuscript, medieval weather, Memling, Mirk Festial, North Street, Prick of Conscience, signs of judgement day on December 20, 2012 by Sarah Peverley. Welcome to my occasional blog – The Parchment Mirror. This is where I will share my fascination with the material remains of the Middle Ages, the manuscripts, literature, art, music, and other precious artefacts, that bring history to life and illuminate medieval culture in thrilling and often unexpected ways. The inspiration for this blog came from a series of ‘Medieval Entertainment’ tweets that I shared on Twitter a few months ago. I originally envisaged the series comprising approximately ten tweets about the different forms of entertainment available to people in the Middle Ages, but the more I explored the various pastimes illustrated in contemporary manuscripts, the bigger the series grew. I ended the series at fifty-six tweets (across two weeks), but I could have gone on, especially if I’d dedicated more than one tweet to the games that I grouped together under the headings ‘ball games’ and ‘board games’. This blog will allow me to revisit the various forms of entertainment I tweeted about and expand on those activities that my Twitter followers and I found most interesting. It will also allow me to share some of the incredible reflections of the medieval world contained within the literature and manuscripts of the period. Watch this space. To officially launch my blog, it is only fitting that I should say a few words about the manuscript that inspired the title and featured in my entertainment series: the famous Luttrell Psalter. The Psalter, otherwise known as British Library Additional MS 42130, is one of the British Library’s greatest treasures; it was made in the first half of the fourteenth century (c. 1325-35) for Sir Geoffrey Luttrell (1276-1345), lord of Irnham in Lincolnshire. Psalters were devotional books that contained the Book of Psalms and other liturgical items, such as calendars, which marked important feast days and often represented medieval life though the ‘Labours of the Month‘. The Luttrell Psalter is particularly special because in addition to containing illustrations typically found in psalters – scenes from the life of Christ and images of the biblical king David, who was believed to be the author of the psalms – the margins of the text are brimming with depictions of daily life in medieval Irnham. From images of low-born peasants tending the fields to striking representations of Geoffrey Luttrell and his noble family feasting and travelling, the psalter offers an exceptional peak at life at both ends of the social spectrum. As we turn the pages of the psalter, moving through the seasons, we are rewarded with representations of contemporary fashion, rural life, feudal obligation, and fourteenth-century humour. Alongside images of work and play, we also find fantastic grotesques and hybrid creatures drawn straight from the imaginations of the psalter’s artists. Extraordinary drolleries like this commonly inhabit the margins of devotional texts like the Luttrell Psalter and scholars believe that they represent the chaos that lurks beyond the borders of established medieval structures and rule. As the proud owner of both the British Library facsimile and ebook editions of the psalter, I never tire of looking at the wonderful scenes. They capture my imagination precisely because of the intimate relationship that emerges between the manuscript’s creators and the landscape the artists chose to depict. To turn the pages of The Luttrell Psalter visit The British Library’s ‘Treasure’ website here. If you fancy time travelling back to fourteenth-century Irnham, watch WAG Screen‘s stunning film based on the Luttrell Psalter below. To learn more about the psalter’s representation of medieval life see the book that inspired the title of my blog: Michael Camille’s Mirror in Parchment: The Luttrell Psalter and the Making of Medieval England. This entry was posted in The Parchment Mirror and tagged Additional 42130, British Library, expert, fifteenth century england, fifteenth century expert, Geoffrey Luttrell, Guy Ritchie, History, Irnham, king arthur expert, king arthur film, Lincolnshire, luttrell psalter, manuscript expert, manuscripts, medieval, medieval art, medieval culture, medieval expert, medieval life, Medieval literature, medieval manuscript, medievalist, Middle Ages, middle ages expert, Mirror in Parchment, parchment, Parchment Mirror, Psalter, Richard III on December 18, 2012 by Sarah Peverley.